By engaging Vaughan Constructions in the delivery of its new facility, GMK Logistics was ready to expand its business and meet new demands sooner than expected. When GMK Logistics, one of Australia’s largest logistics suppliers to the warehousing flooring industry, outgrew its warehouse at Smeaton Grange in Sydney the company knew it wanted to build a well advanced and purpose-built facility for its new premises. Following an extensive search of potential sites, GMK decided to develop a site at a nearby facility in Gregory Hills, Sydney. 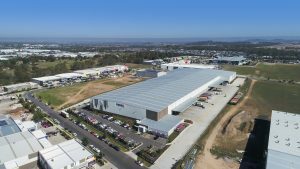 The plan for the warehouse was to build a 15,000-square metre warehouse and 1,300-square metre office on the 16,300-square metre site, more than double the size of the previous facility. Having previously worked with Vaughan Constructions, GMK Logistics once again partnered with recently crowned Master Builder of the Year by the Master Builders Association Victoria Awards 2018 to develop a new facility fit for the company’s significant growth. Vaughan Constructions understands the importance of client-focused based projects and has more than six decades of experience in the Australian building and property sector. According to Colm O’Reilly, Construction Manager for New South Wales, Vaughan’s philosophy is to build customers for life. “GMK had outgrown their previous facility – they were busting at the seams. With more growth already projected we had to ensure that we built an adequate facility,” Colm says. Vaughan Construction makes sure that the design features optimum efficiencies. “In this case that included ensuring that all freight came in one side of the warehouse and out of the other this aided the operation both internally and externally. With a one-way system of goods and traffic,’ Colm says. Covering four hectares of land, the original proposal was for a 16,300-square metre warehouse. “The original timeline was to expand within five years, but GMK were expanding quickly and before we were finished building the warehouse GMK were already looking to expand,” Colm says. Vaughan ensured that every aspect of the building allowed for GMK’s future expansion plans. This included town planning, where the future expansion was included with the original development consent, reducing the time to commence building considerably. “We knew we had the option for an extension in five years but by the end of the first year we had already reconfigured our racking. Vaughan’s design gave us the confidence to take on new business knowing that we could expand with ease. We had a build it and they will come attitude. And they did,” Gary says. Vaughan recognises that if you go back and retrofit for expansion it can be very expensive and take a lot of time. “A lot of expense can be wasted on upgrading and extending completed building services, particularly where demolition is required to expose them for connection or upgrade. So everything needed to be considered, to ensure there was sufficient capacity for the expansion but we didn’t over capitalise on uncertainties. In terms of water supply, sprinkler tanks or future power requirements, these were all completed to predetermined requirements of the expansion. Whereas infrastructure like stormwater detention were constructed temporarily in an open pit until the final requirements were finalised during the warehouse expansion design. Similarly, we ensured where possible that no services would be made redundant by the expansion,” Colm says. “The full extension was completed in April 2018 and has already achieved strong uptake from new and existing customers,” Gary says. GMK Logistics is a national specialised logistics service to the flooring industry in Australia. The company is a subsidiary of CTI Logistics Limited, which is listed on the Australian Stock Exchange. With a fleet of more than 60 vehicles and fully outsourced warehousing solutions. 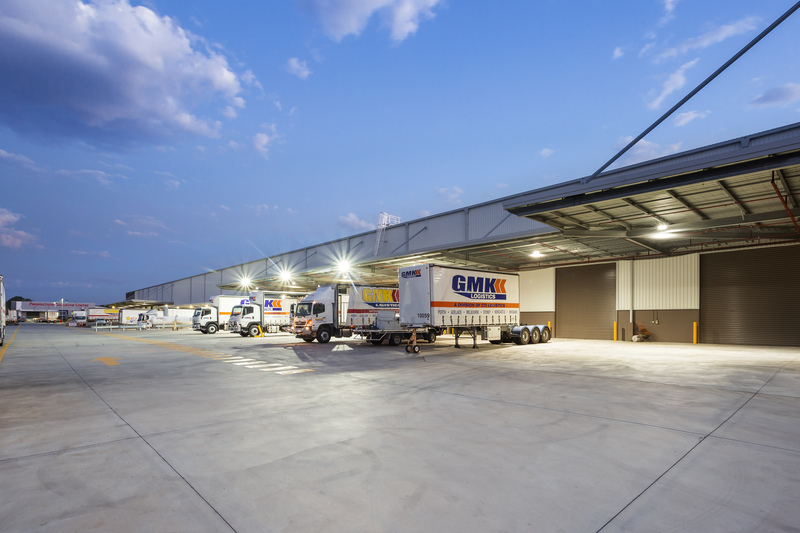 GMK’s modern warehousing facilities allows them to deliver products on time and in good condition, anywhere in Australia. Working with Vaughan Constructions gave them the confidence they need to concentrate on their customers’ needs and requirements and the ability to capitalise on new business opportunities.